AB Spirit Wear (and other items) courtesy of the School Store at the High School. The School Store at the High School has items for everyone and is open to the public 7:30 AM – 3:00 PM every day. Located right off the main lobby on the left. For the 6th g raders who will be graduating and heading up to the Jr. High, we have some double insulated aluminum AB water bottles. What a great graduation gift idea! 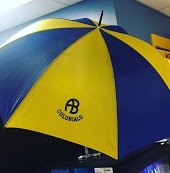 We also carry AB golf umbrellas for those sporting events out in the rain, and we have sleek AB travel mugs for hot beverages. We carry various apparel items that change throughout the year, hooded sweatshirts, flannel pants, sweatpants, t-shirts and more. We also have great prices on school supplies and carry snacks and drinks. Come visit us! You can check everything out on our website. Click here.